Prozis Sport Glycine – Enhance your muscle mass and treat several health problems with this extraordinary amino acid! Studies have shown dramatic increases in strength and energy levels in athletes that used glycinesupplementation, when compared against control groups that took a placebo. The results of these studies enabled scientists to determine that glycine supplementation can increase strength by up to 12%, and increase general energy output by up to 32%, making this amino acid an extremely valuable element for all those looking to enhance their sports performance. Numerous studies have investigated the benefits of this amino acid in the treatment of several disorders of the central nervous system, such as schizophrenia, hyperactivity, and epilepsy. Researchers discovered that glycine supplementation can alleviate negative symptoms associated with these conditions. 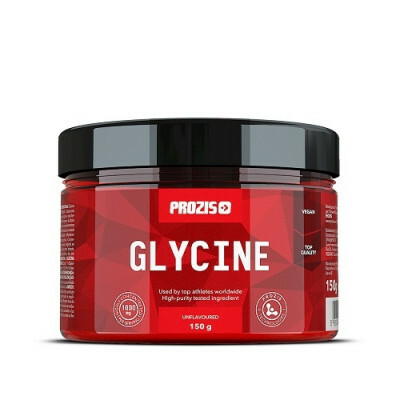 Understanding how useful this combined physical/mental effect can be for athletes, Prozis Sportdeveloped Glycine, a pure glycine supplement that will bring you all the extraordinary effects of this amino acid. With nothing but 100% pure glycine powder, Glycine will revolutionize your sports and mental performance. Kasutamisjuhend Take 1 serving per day.